1. Begin with drawings. After discussing the picture with your child, suggest words they can add that express emotion, like “ouch” or “happy”. This gives your child the idea that words convey feelings too. 2. Use writing prompts to stimulate ideas. “Be true to your work, your word, and your friend.” (Abraham Lincoln) “Being true” means doing what is right. What would you do if you saw a friend cheating? Report it, talk to the friend, or do nothing? By writing about a problem, your child defines their own reaction. 3. 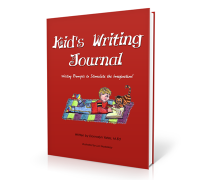 Always ask if your child wants to share their journal writing. Privacy is important. If you write about the same prompt in your own journal and share, it encourages discussion. 4. This is your time to be completely focused on your child and what they think. Enjoy and have fun! Write a love note to your child!